I’ve attempted to write this piece for several months now. It first started out as a piece on my experience taking a toddler to the Chicago Comic Con back in August. Then it evolved into a piece about finding “geek” and “super hero” clothing that’s for girls and doesn’t include a tutu. Then I sat back and realized I’ve written on both of these topics before. 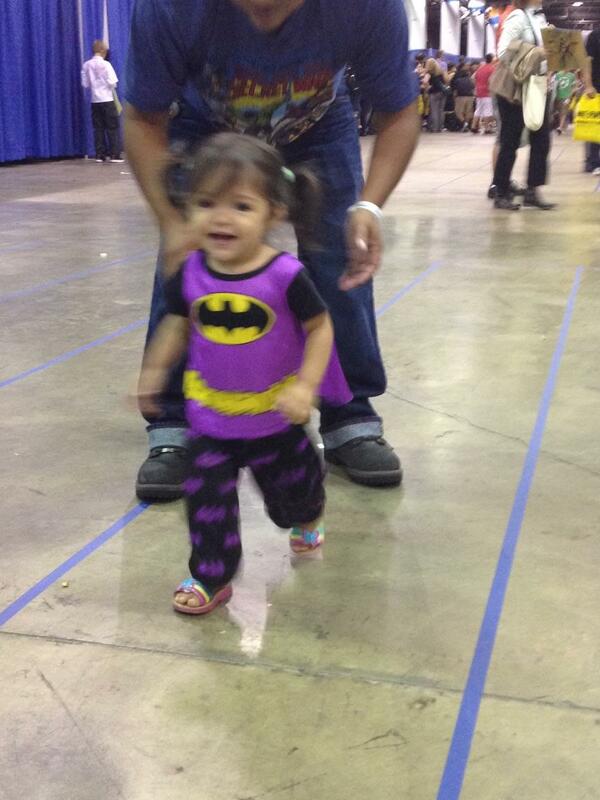 First I wrote about taking my daughter at age 7 months to Comic Con and I either wrote a separate piece or within that first piece I wrote about how hard it was finding an outfit for her to wear. I needed to write about something else, but yet I still felt the need to touch on the subjects I’ve discussed before. Then yesterday, while scrolling through Facebook, an article caught my eye. The title of the article was something along the lines of “Everything pink is not lame”. The basic premise of the article was that in order to guide our daughters into equality and feminism, women are bashing anything pink and princesses and why that is not okay. It really made me reflect on how I’m raising my daughter. 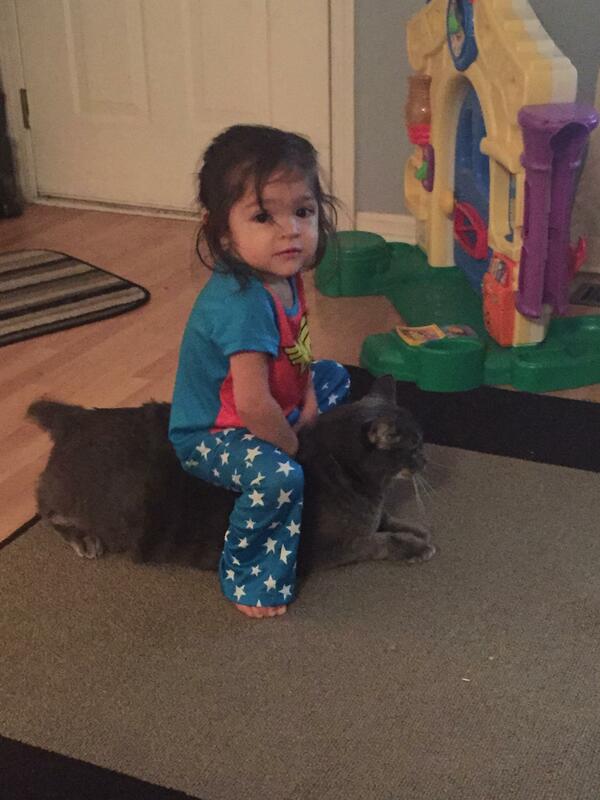 hanging out with her bff and battlecat. I’ve been very adamant that my daughter not have limitations placed on what she can or can’t like or do in life. I’ve made sure to try and expose her to as many options as possible, whether it’s in music, tv, movie, books and toys. She has been to the Chicago Comic Con twice now and I plan on bringing her every year I go. We go to the zoo and museums. I allow her to run and play with whatever she wants (within reason and safety of course). She has baby dolls, cars and fire trucks, a kitchen set and a tool set. She watches not only Sophia the First, and Doc Mc Stuffins (notorious girls shows) but she also watches Mickey Mouse Clubhouse, very old classic Mickey Mouse cartoons, Scooby Doo and Jake and the Neverland pirates. For Christmas, she received clothes that had both Minnie Mouse and superheroes on them. My daughter also owns so much pink stuff it’s ridiculous! But after reading this article I had to wonder, am I limiting my daughter by not supporting her right to WANT to play with princesses? I sat back and looked around at my daughter’s toys and watched her play. She alternated between wanting to build a snowman out of play doh to forcing her father to have a picnic with her in front of her kitchen set. One minute she would be asking her baby doll “baby, you okay?” and the next she’s throwing items at me telling me to “Catch!”. In the spring and summer, my daughter loves to dig in the dirt, poke bugs and run and kick a ball down the street. She also enjoys being pulled in her wagon, swinging in the swings and playing in the pool. Some of these behaviors can be classified as “typical boy behaviors” and some as “typical girl behaviors”. But I like to think of them as Typical Amaya Behaviors. After reflecting on that for a minute I realized that as long as I continued to support my daughter and her hobbies, I don’t think I would be limiting her. At least, I hope I’m not. a hero always has things to do! no stopping her now! Then I started to think about the article some more and the discussion around pink and princesses. I don’t deny my daughter anything simply because I don’t think it supports the idea of feminism. But at the same time, I started to wonder why it bothered me so much that superhero clothes for girls were pink and glittery. Was it really because I felt that it didn’t display the proper “colors” of the superhero? Or was it just because it was pink and glittery? And is it so bad that the superhero clothes for girls were so pink? 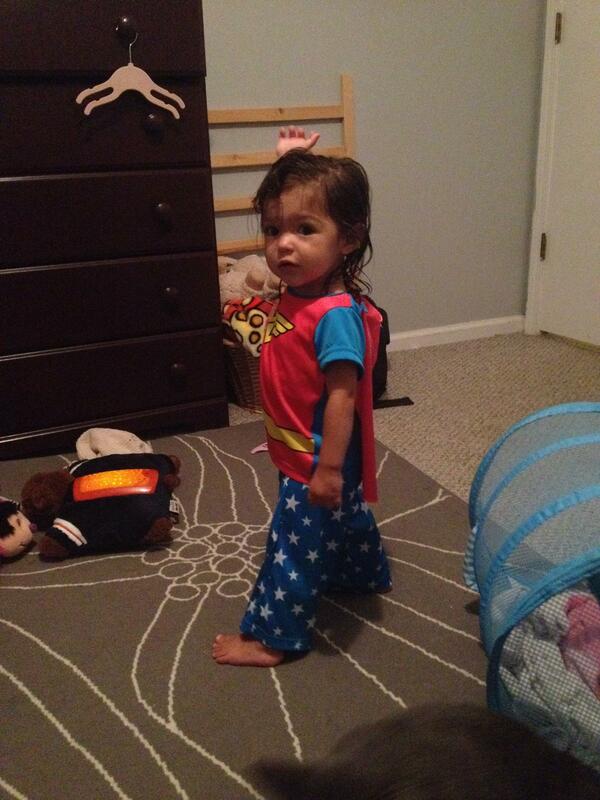 Would it really be so bad if my daughter wanted to wear a Superman shirt and a tutu? But what if my daughter doesn’t want to wear that? 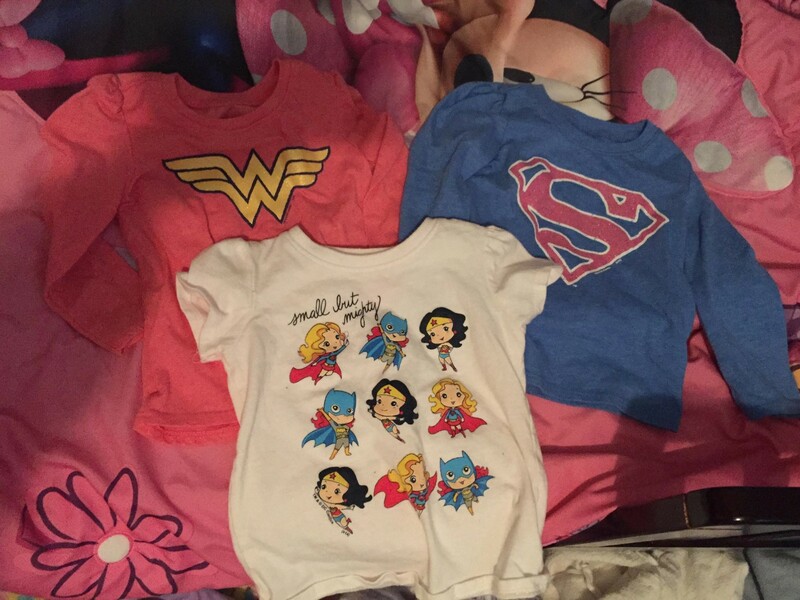 What if she wants to wear a Superman or Wonder Woman shirt that depicts the character in its true form? Shouldn’t she have that option? So as I pondered these questions, I came to the conclusion that I was really frustrated about the lack of options and not so much at the idea of the clothes coming in pink. But when I really pushed myself, I realized that maybe I was the one that wanted options. After all, my daughter is only 2, she doesn’t care if the shirt is pink or blue, if she wears pants or a tutu (okay, she may have an opinion on that) but ultimately, right now, my daughter isn’t making choices on her clothes, I’m making those choices. 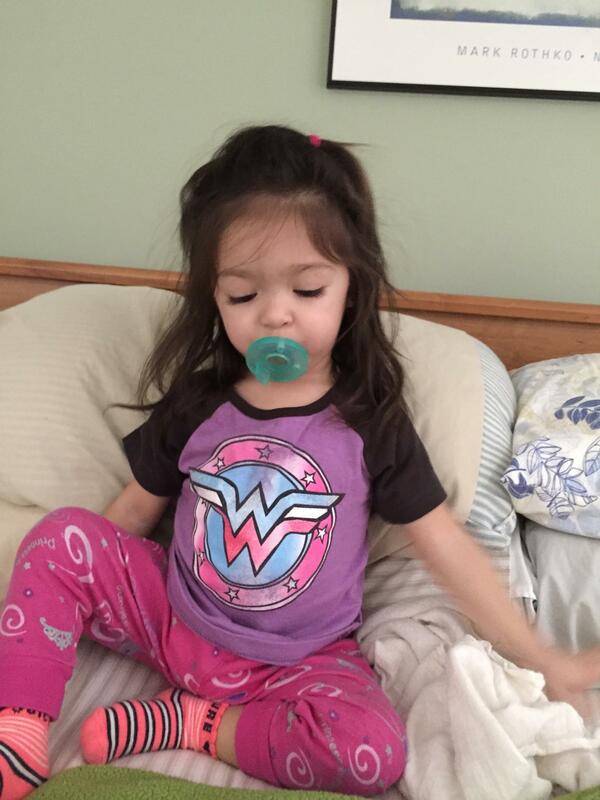 And right now, it’s okay if her Superman shirt is blue but the symbol is in pink. It doesn’t make it any less adorable when she wears it and the meaning doesn’t change. 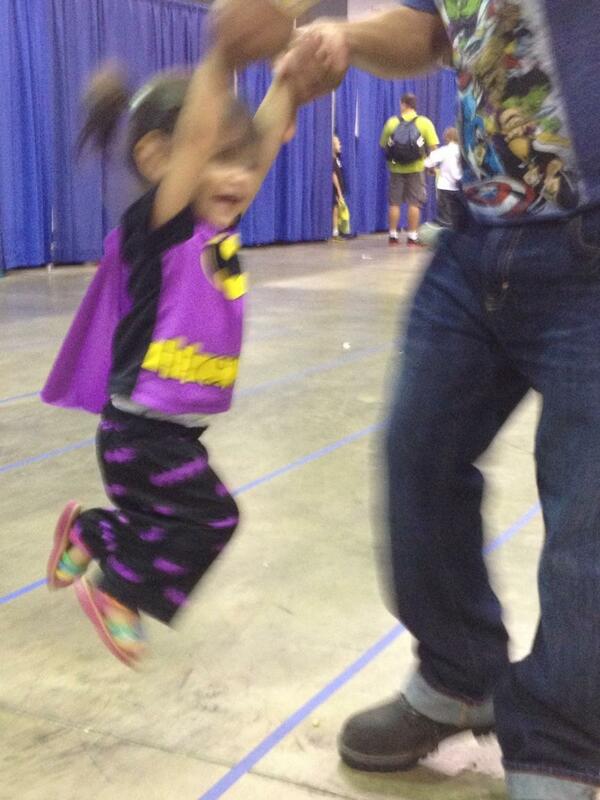 For this year’s comic con she wore a pair of boy’s batman pajamas (complete with cape) and pig tails. I received a lot of compliments, but would I have received fewer compliments if she was in pink and not purple? Did it matter or did anyone complain that the pajamas were purple and black and not yellow and black? Nope, it didn’t matter and no one complained. It also didn’t matter that I chose to put her in the batman pajamas and not the wonder woman pajamas that she also has and that are the accurate colors of wonder woman. No one asked why she wore batman, and not a female costume. I only received positive comments directed towards my daughter. And as my daughter gets older and focuses in what interests her the most, her options will expand. As an adult I do have the option of getting a pink shirt or a more “authentic” superhero shirt. I do have options and I need to not focus in on what options my daughter doesn’t have right now, but I need to make sure she has those options as she grows up and that she knows SHE can make those decisions and not have society force them upon her. However, I will admit, that I’m seeing more and more superhero clothes for girls that are less frilly and more authentic (for lack of a better word) and I’m pleased by this, but only because my daughter won’t wear a tutu anymore no matter how hard I try and cram her into one! And I think that’s what is really important about being a “geek” is that we embrace what is different and we acknowledge that is what makes someone special. A true “geek” is someone who embraces that unique quality within themselves and thrives on the fact that they can find others who share their hobbies and fandoms and they support each other. They support each other. They support each other. I think that is one of the most important things that I need to remember in raising a geek baby. I need to make sure I’m supporting her completely. If she grows up loving pink, princesses and tutus. Whether she joins drama club or cheerleading in school. In the end it doesn’t matter, as long as I support her. Although, I will admit this, if she doesn’t love Harry Potter, I may be a little crushed.